: No matter where I travel, visiting the local parks is always one of my favorite activities. It’s in those places where you can discover the natural beauty and personality of the city and its people. My visit to Retiro Park was in the autumn so the weather was great. The park is located in the heart of the capital, only steps away from the famous Puerta de Alcalá, and is where thousands of locals and tourists go to relax. The immense park measures 118 hectares and traces its origins back to King Henry IV around the year 1640. As you stroll around the walkways, you’ll find gorgeous gardens, fountains, and monuments. The Retiro park is one of the "green lungs" of the city of Madrid and one of my favorite parks for the privileged location. When Spring comes, the park comes back to life with the green color, the activity of thousands of sportsmen and sportswomen, going through the paths running, walking, riding a bike or skating. In the center of the park, we have the lake used by many to take a boat tour. Other spots are also nice, more in the inside, like the Crystal Palace, where there are many (strange) exhibitions. It also has many terraces to have an aperitif and even clairvoyant at tables next to the lake. During one of our visits to Madrid on an autumn evening, we strolled through Retiro park. We entered at the Fallen Angel entranceway and left through the Alacalá entrance, on Alcalá street. In addition to enjoying a perfect afternoon and seeing a beautiful sunset from the inside of the park, we were able to see the Puerta de Alcalá, Cibeles plaza, the Neptune statue, and Atocha plaza on our route. It’s interesting to see the transformation and different styles of architecture in the monuments and plazas of Madrid. There’s so much beauty in the buildings at night, when they’re all lit up. 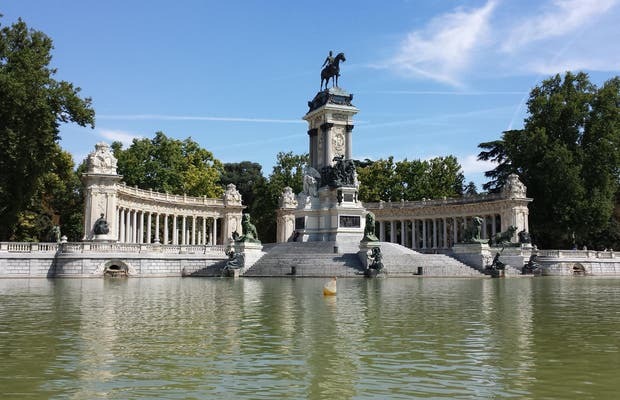 The Retiro is one of the favorite leisure places for both locals as for tourists. The numerous lawns, natural shadow, trees and the areas next to the pond are a perfect place to spend a sunny afternoon. Especially during the spring and summer seasons, the people go to this park during the weekends to enjoy a place where they can do sports, take the sun or have contact with nature after a whole week living with asphalt around. In the Retiro Park it is estimated that there are 15,000 trees spread over the 120 hectares of field, approximately. There are Indian chestnut trees, cherry trees, acacias, plane trees, birches, oak trees, ash trees, elm trees and olive trees.